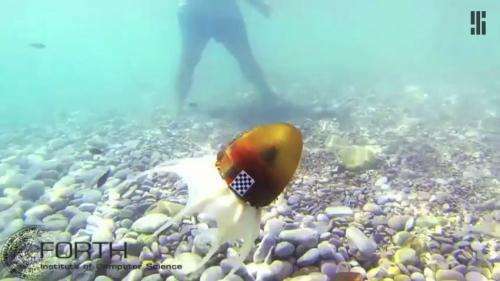 Highlighting this month's news of developments in marine robotics: Researchers from the Foundation for Research and Technology-Hellas in Greece have worked out a way to mimic the movements of an octopus. The robot, which swims and crawls, is inspired by the morphology and very able locomotor capabilities of the octopus. The octopus of their creation, which is being described by various sites as the octobot or "robotic swimmer," among other terms, propels itself underwater either alone of interconnected via a passively compliant web, said the team. Their study, "Multi-Arm Robotic Swimming with Octopus-Inspired Compliant Web," was prepared for this year's IEEE/RSJ International Conference on Intelligent Robots and Systems in Chicago. They used flexible silicone webbing, which served them well. The authors said, "Speeds of 0.5 body lengths per second and propulsive forces of up to 10.5 N were achieved, with a cost of transport as low as 0.62." Evan Ackerman reported Wednesday in IEEE Spectrum that the research reflects a success story where the team last year reported they were working on adding another physical feature in the version of the octopus: a web between tentacles, which they said might help swimming speed or efficiency. "Now the researchers report that the addition of a soft and supple silicone web has nearly doubled the speed of the roboctopus, and not satisfied with that, the scientists have also taught it to crawl, carry objects, and swim free in the Aegean Sea," said Ackerman. By contrast, reported Meghan Rosen in Science News, their webless version had shown it could propel itself at up to 100 millimeters per second, slowly opening stiff plastic arms, then snapping them together. This year's robotic swimmer, with arms and a web made of soft silicone, swam at up to 180 millimeters per second. "The web helps the octobot generate more force," wrote Rosen, "so it can push through water faster than using arms alone." What benefits could result from this type of research? Team member and computer scientist Dimitris Tsakiris said the creation may support biologists' attempts to observe marine ecosystems. "We want to put a camera on it and see what we can do," he said in Science News. Another bit of encouraging news about their work is that other sea creatures did not appear to be frightened off at the sight of the robot swimmer. Tsakiris said the faux octopus was taken out for a swim in the Mediterranean and tiny fish tagged along.